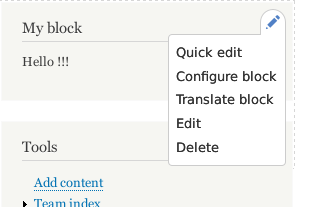 I have two identical sites on Drupal 8 (A and B), on (A) I created a custom block(block/add), and then I export the configuration(drush config-export) and import this config on (B) (drush config-import), no error, but on the site (B) the block that I imported said on any region that I put "This block is broken or missing. You may be missing content or you might need to enable the original module." And I cant edit the content of this block. How I can fix that? A custom block is made of two entities, one for the placement and the actual content. Only the actual placement can be exported with cmi. The content can not. You can either send your content via REST or you can manually edit the uuid of another block to match. In the future you'll be able to use Entity Pilot (entitypilot.com) - disclaimer - this is my product. Transfer these new sql files to Site B via git or other method. If you're doing this often, you could even get fancy and put the above mysqldump commands into a pre-commit hook. Thanks to everyone that posted here; we were really confused about this issue (blocks, block configuration, and the CMI). Using the information here as a starting point, I created the following script (you can run it with drush php-script from your Drupal root) which will fix the UUIDs in the database. This assumes that the blocks you want to use are already there however (which isn't a problem for us since our blocks come over from a Drupal 6 migration). The script also assumes that the 'info' value for each block, a.k.a. its 'label' is unique, so your mileage may vary. We will need to figure out a way to script the creation of new blocks as well so that any configuration exported from our development environment can be used in our production environment as well, but that is another story. See easily add default content with update hooks for more. I have just publish a contributed module that solves this. Essentially, the module provides a type of block based on configuration (the fixed block) that wraps a custom block (the content block). The fixed block is stored in the website configuration along as the default content. 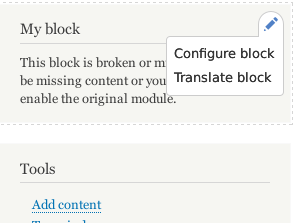 In your scenario, the custom block is created automatically in the site B with the default content as soon as needed. Not the answer you're looking for? Browse other questions tagged 8 blocks importing-exporting configuration-management or ask your own question.